Virco's Zuma Series Teacher Chair is contemporary, comfortable and comes in a great selection of vibrant colors, making it popular choice among educators. The flexible soft plastic seat is ergonomically contoured to offer support where you need it most. Five dual-wheel, swiveling casters rolls easily, even over carpet. Adjust the seat height of the chair from 16" to 20 1/2" with the easy-access lever. This chair is best suited for larger students or adults. Virco's Zuma Series Teacher Chair is GREENGUARD certified and backed by a 10-year warranty. 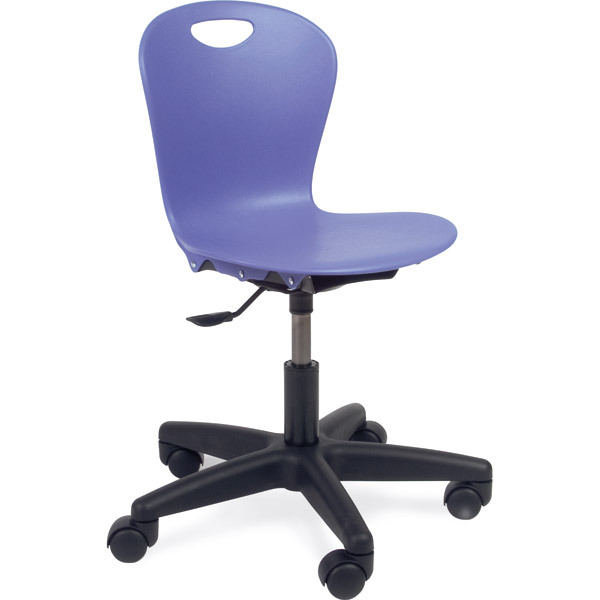 Adjust the height from 16" to 20 1/2"
Seat Height: 16" - 20 1/2"
Virco's Zuma Series Teacher Chair is contemporary, comfortable and comes in a great selection of vibrant colors, making it a popular choice among educators. The flexible soft plastic seat is ergonomically contoured to offer support where you need it most. Five dual-wheel, swiveling casters rolls easily, even over carpet. Adjust the seat height of the chair from 14" to 17" with the easy-access lever. This chair is best suited for younger students or smaller adults. Virco's Zuma Series Teacher Chair is GREENGUARD certified and backed by a 10-year warranty. Adjust the height from 14" to 17"
Width: 16" - 20 1/2"
The ZUMA Teacher Chair by Virco offers a fun and modern twist on the standard teacher chair. And SCHOOLSin is offering it at an unbeatable price. This sturdy teacher chair is designed to provide optimum comfort for years to come. Available for order in a variety of colors and sizes. GREENGUARD certified. We are happy to assist you with a quote or order for Virco Zuma chairs or any school furniture product. Just give us a call at (877) 839-3330.